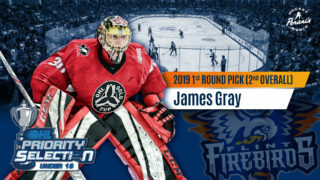 Flint, Mich. – The Flint Firebirds were active in the 2018 CHL Import Draft Thursday, selecting Czech Republic forward Jan Jeník with the first-round, 6th overall pick. Jeník, a native of Nymburk, Czech Republic, was recently selected by the Arizona Coyotes in the third round (65th overall) of the 2018 NHL Draft. He recorded an impressive 15 points (7G, 8A) in 19 international games with Czech Republic’s National Men’s U-18 Team during the 2017-18 season. At the 2017 U-18 World Championship in Russia, Jeník tallied six assists, including a plus-one rating and 13 shots on goal in seven games. He spent last season with HC Benátky nad Jizerou in the WSM Liga (formerly the Czech 1.liga) where he notched 11 points (4G, 7A) including 67 penalty minutes in 30 games. Also during the 2017-18 season, Jan played in six games with HC Bílí Tygři Liberec in the Czech Extraliga, which is the highest level of play in professional Czech ice hockey. Flint Firebirds 2018 CHL Import Draft First Round Pick Jan Jeník. Jeník is a six-foot-one, 165-pound left-handed forward. Prior to Jeník’s first year of playing professional hockey, he averaged more than a point-per-game for the past two seasons. He tallied an impressive 55 points in 45 games with HC Bílí Tygři Liberec during the 2016-17 season after posting 63 points in 49 games during the 2015-16 season also with HC Bílí Tygři Liberec. The 27th annual CHL Import Draft included a total of 77 players consisting of 47 forwards and 23 defencemen while seven goaltenders were selected, marking the first time since 2013 that they have been eligible. The 77 players were chosen from across 12 different countries featuring a draft-high 16 players from the Czech Republic. 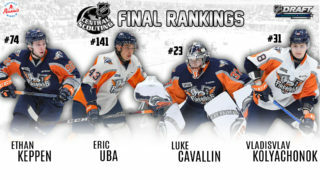 The Ontario Hockey League (OHL), known as the premiere player development league for the NHL, is one of three major junior ice hockey leagues based in Canada and the United States that constitute the 60-team Canadian Hockey League (CHL). The other two leagues that make up the CHL are the Quebec Major Junior Hockey League (QMJHL) and the Western Hockey League (WHL). Through the CHL Import Draft, every team in the CHL has the option to protect up to two players from outside North America to add to its roster. Picks are chosen in reverse order of the team’s standings in the CHL. 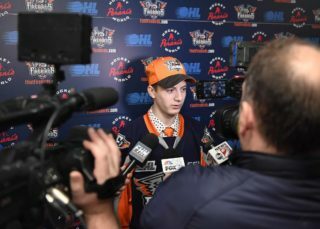 The import draft is seen as a way to raise the level of competition in the CHL, as well as to broaden its fan base while retaining high North American content. For the first time since 2013, goaltenders were eligible for selection in the CHL Import Draft in addition to forwards and defensemen. The Firebirds’ training camp will take place Monday, Aug. 27 through Wednesday, Aug. 29. The camp will be held at the Firebirds’ official practice facility, Iceland Arenas, and is open to the public with free admission for all on-ice sessions. Season ticket packages for the Flint Firebirds 2018-19 season are on sale now and can be purchased at the Dort Federal Event Center Box Office, Monday thru Friday from 9 a.m. to 5 p.m. (ET). Season ticket holders receive FREE parking this season. For more information, contact the Dort Federal Event Center Box Office at (810) 744-0580 or email mary@dorteventcenter.com.